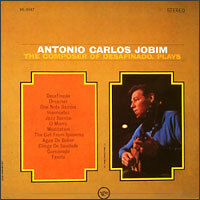 As the title suggests, the king of bossa nova Antonio Carlos Jobim plays his own compositions on piano and guitar, with a beautiful orchestra, including strings, arranged and conducted by Claus Ogerman. Jobim's piano style here is unique: most of the time he chooses simply to play single notes with his right hand, but somehow it sounds totally approprite in front of the gorgeous orchestration of Ogerman. The sound quality is very good, with lush strings and huge soundstage. Recorded in May 1963 in New York. This limited SHM-SACD DSD remastered based on the 44.1kHz, 24-bit PCM masters produced in USA in 1995 from the original analog tapes. Stereo.